Canada’s Parliament buildings were conceived in 1859 after Ottawa was chosen as the capital of the then Province of Canada. 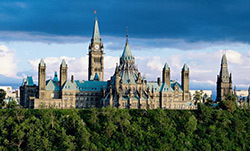 The three gothic revival buildings sit atop a rugged escarpment along the Ottawa River in the centre of the city. The Centre Block, which contains the House of Commons and the Senate, is flanked on either side by the West Block and East Block – each containing offices for senators and members of parliament. Over the next decade, a long-term work plan will see all three buildings rehabilitated. Carleton University’s Immersive Media Studio has been working with Heritage Conservation Directorate (of the Public Works and Government Services Canada or PWGSC) to explore the use of digital fabrication for the rehabilitation of traditionally cut sculptural elements. As part of the ongoing preservation work undertaken by PWGSC, a single sandstone relief sculpture was identified on the façade of the East Block to be replaced due to its deteriorating condition. The sculpture features an owl among thistles carved into a 1725mm x 1120mm piece of Berea sandstone. The owl and thistle sculpture is in poor condition, and actively deteriorating. The vertical facebedding of the stone, combined with decades of erosion and freeze-thaw cycles have resulted in much of the carved detail in the stone de-laminating and spalling off. The reconstruction process begins with creating a copy of the extant stone carving. Rather than using a plaster casting process to create a copy, however, the relief sculpture was digitized using photogrammetry. From that digital model, a copy of the sculpture was milled from high-density polyurethane foam using a 3-axis CNC router at the Carleton University School of Architecture. The foam maquette, taking the place of the plaster copy, served as the basis for the Dominion Sculptor of Canada to rebuild the damaged areas with modelling clay. With the modelling clay overlay applied, the maquette was digitized again. From this second digital model, which incorporates the clay work of the sculptor and the digitally reconstructed moulding, a series of test pieces were milled from foam using a KUKA KR 120 R2700 extra HA robot integrated by New Age Robotics. 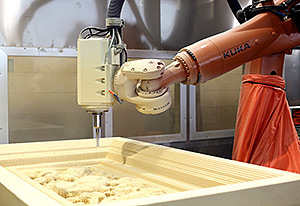 Once suitable milling parameters were determined, the final relief sculpture was milled from sandstone using the KUKA/New Age Robotics milling system. The robot milled the sandstone within 1.5 mm of the surface of the digital model. This provided material for the Dominion Sculptor to remove using traditional stone carving tools in the process of adding details and textures to the entire surface of the relief sculpture. Once the sculptor’s hand finishing is complete, the relief sculpture will be installed in the façade of the East Block building on Parliament Hill. There are about 4,500 sculptures inside and outside the Parliament, and many of them (like this sculpture) need restoration. In addition, there are 200 sculptures that have yet to be sculpted.